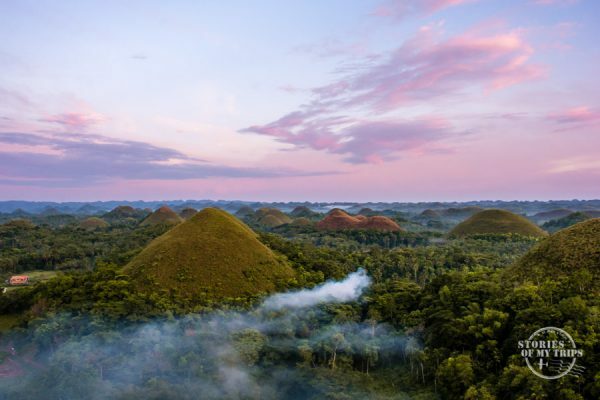 In this post, we tell you all the details about our transportation in the Philippines between islands and within the islands, so that you can have an idea of how the country works and can organize your plans better. We had to fly sometimes and rent motorbikes on some islands. 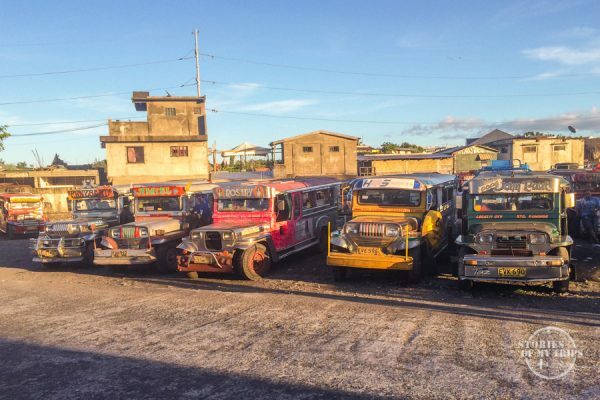 In most places, there are Jeepneys to travel short distances and many trycicles everywhere. 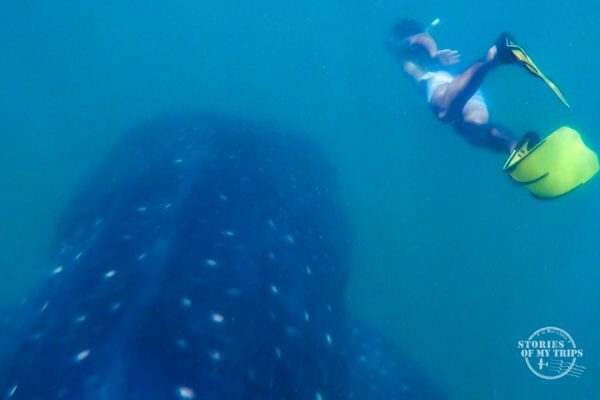 The first thing we wanted to do in the Philippines was to see the whale sharks. For ethical reasons about the treatment of the animals, we decided to go to Donsol and not to Oslob, but first, we had to fly to Manila. We landed at dawn at the Manila airport and that morning we had a flight to Legazpi. When we got to the Legazpi airport we took a tricycle to the bus station and from there we took a minivan to Donsol. The minivan dropped us off in the center of Donsol but we went to the Dancalan area, where the visitor center is to see the whales. They are only 2km apart and tricycles abound. As always, you have to negotiate a fair price. There are 3 times to see the whales: 7 am, 11am or 1 pm. We went at 1 pm to avoid going with many tourists, but we had no luck, the tourists were gone and so were the whales. We didn’t see any! We also had to wait a long time for more people to arrive and share a banca. The next day we tried again at 7am and although it is true that there were much more people, there were also more whales and we saw 5! Nos fuimos muy contentos y luego tuvimos un largo viaje hacia nuestra siguiente parada, Puerto Princesa. To go from Donsol to Puerto Princesa we first had to go back to Manila. We took a minivan back to Legazpi and from there a night bus to Manila and we traveled all night. There are several companies that travel to Manila with different schedules, buses are very frequent. We arrived in the early morning to Manila and our flight to Puerto Princesa was leaving in the afternoon, so we had to sleep at the airport. We flew from Manila to Puerto Princesa with Air Asia for a very good price. 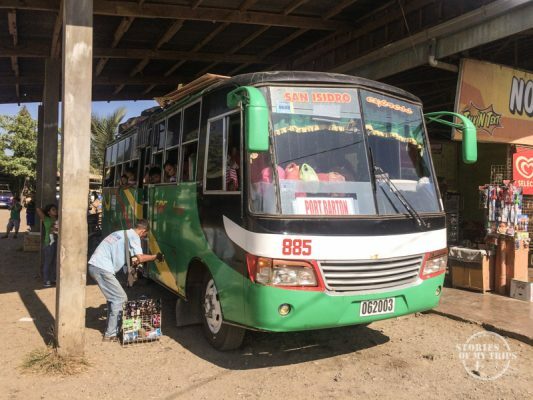 To go from Puerto Princesa to Port Barton, we took a tricycle to the bus station San José and from there we took a local bus to Port Barton. The bus is a bit difficult to find and there are many people at the entrance offering the minivan service. To find the bus you have to go all the way to the back of the station and look for the green bus. The employees at the station helped us find it. The road was long but fun. There is also the option to buy a ticket in a minivan (for foreigners), but we always prefer to take public transport when it is available. Port Barton is quite small and you can walk everywhere. There is a very nice beach called White Beach, you can walk there or take a motorcycle, it is 4km away. We got there walking along the beach to the south and the locals on the road indicated the way. The entrance to the beach is for a hotel, so you have to pay 20 pesos, but it’s worth it, it’s a beautiful beach. 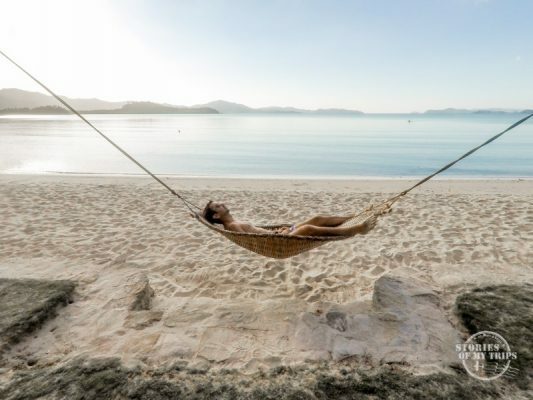 To tour other islands around, beautiful beaches and snorkel, there are many offices on the beach offering tours A, B, C etc. We made a mix of the 3. We loved Port Barton and spent several days enjoying its peace and tranquility. When it was time to leave, our next destination was El Nido. To go from Port Barton to El Nido, we first took a Jeepney to Roxas at 8am and at the Roxas bus station we took another bus to El Nido. 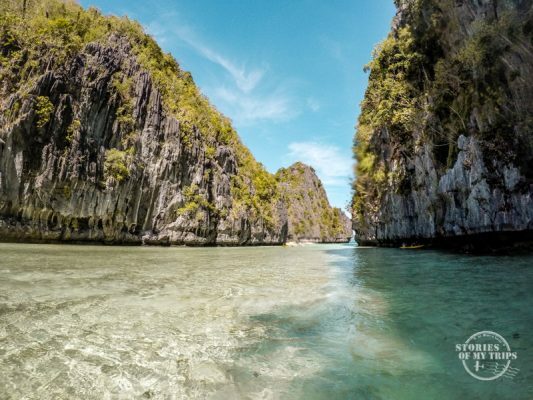 There is also the option of going by minivan directly to El Nido and any tourist office can sell you a ticket. When we arrived in El Nido we walked from the bus station to the center while looking for a hotel. The beach of El Nido is nothingreally special, so we went on a tricycle to Las Cabañas, which is a few kilometers away from the center and it’s much more beautiful. We also rented a Kayak to go to one of the islands near El Nido which was empty. To make the tour of the islands (Island Hopping), there are many options throughout the city. We didtour A that included Big Lagoon and Small Lagoon and it was wonderful. So much beauty in just one day! 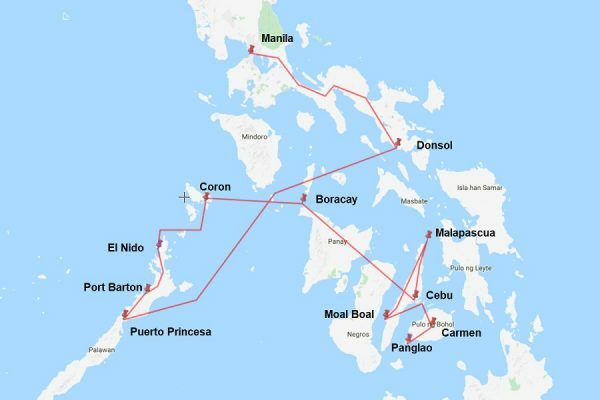 After El Nido our next stop was Coron. To go from El Nido to Coron we bought the slightly cheaper Ferry tickets directly at the port office. We asked at the police station there where to buy the tickets and they sold us the tickets themselves (yes, the police!) for the Slow Ferry (banca). The ride was much longer than we expected and the ferry quite uncomfortable. It was better to sit on the deck’s floor upstairs than on the ferry seats. When we finally arrived (like 5 hours later), we were able to easily walk to the center to look for a hostel. 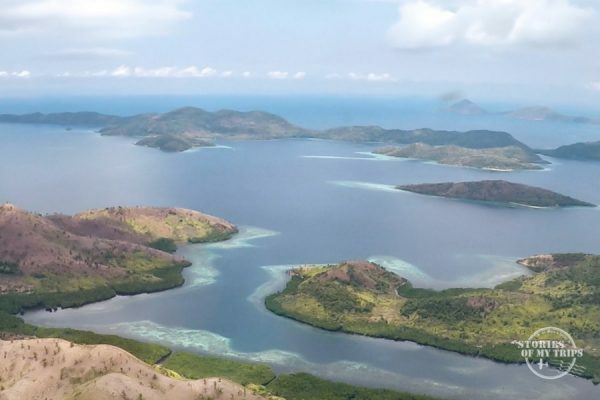 In Coron we went diving with Busuanga Sea Dive and it went very well, we dived to the shipwrecks and in Barracuda Lake. Here was our last stop in this part of the Philippines. We went from the backpacking world in Palawan to the commercial and touristy world of Boracay to celebrate my birthday. To go from Coron to Boracay we found an airline called Air Juan that took us in a small 9-seat plane, directly to Caticlan, the closest airport to Boracay. If you buy the tickets well in advance, they can be very cheap. We paid $80 buying them the week before, and other passengers who bought them 2 months before paid only $20. 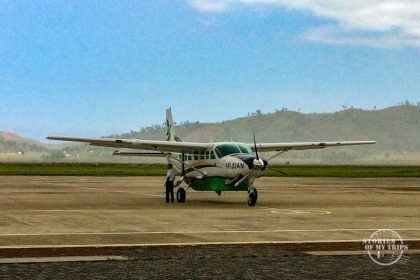 To go from the center to the airport in Coron, we had to hire the minivan service because there is no public transportation. When we arrived in Caticlan, we had to take a tricycle to the port to take a ferry to Boracay. To buy the ferry tickets you have to make 3 different lines to pay the environmental tax, the tax for using the terminal and finally the ferry ticket. When arriving in Boracay it is best to avoid the tricycles at the entrance of the port, as they always want to overcharge tourists. We had to walk far enough to be charged something reasonable, but this is a very common problem in Boracay. Our hotel was in the center and we walked to several places. The beach in Boracay is beautiful and fun, very different from that of Palawan, with lots of people, bars etc. To get away from the noise we went several times to Puka Beach by hiring a moto-taxi that fit us both at the same time in his scooter. We agreed to be picked up after sunset. After several days of party and celebration, we returned to our life as backpackers at our next destination: Cebu Island. To go from Boracay to Cebu Island it is possible to go by land, but it takes a long time so we decided to fly from Caticlan, making the same way back: ferry, tax payments, and tricycle. At the Cebu airport you can take a bus called MyBus that goes to a mall in the center of the city and from there we walked to our hostel. Since we had no interest in spending time in the city we only spent one night here. The next day we went straight to Malapascua. To go from Cebu City to Malapascua we had to take a bus from the north bus station to Maya, a port in the north of the island. From there we took a ferry to Malapascua. We bought the ferry tickets right there in a small post in the port, next to the bus stop. When we arrived in Malapascua we walked around looking for a place to stay. In Malapascua, there is not any form of transportation, only the occasional motorcycle, but it is so small that everything is close by foot. 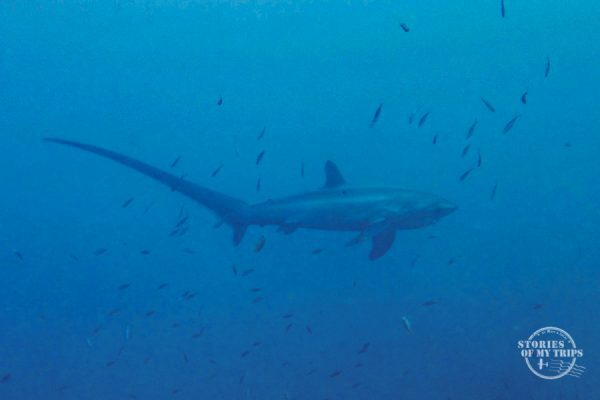 We went to Malapascua to dive and see the thresher shark. We dived with the guys from Blue Water Dive Resort and it went very well. We also went to Gato Island with the same dive center. After some great days in Malapascua we continue our journey to Moalboal. To go from Malapascua to Moalboal we had to take the ferry back to Maya, a bus to the north bus station of Cebu City and then go to the southern bus station, from there we took a bus to Moalboal and when we got there we looked for a hotel near Panagsama Beach. Moalboal is super small, and most activities happen in the water, so it is possible to walk everywhere. We went to see the Sardine Run, the second largest in the world (!) and to dive in the nearby islands. We decided to see the Sardine Run by snorkeling and not diving because I wanted to be closer to them and to be able to play with them. To reach them, you only have to rent the equipment and enter the water through the Savedra Dive Center and a few meters into the water you’ll find the sardines. For diving, we went to Pescador Island with the guys at Savedra Center and it went very well. We saw many companies offering tours to do canyoning and hiking in the area, but we did not do them, we just wanted to be in the water, but apparently, it is a common thing in the area. Also, there are many offering for swimming with the whale sharks in Oslob, which we definitely don’t recommend. For more info, you can read this article. After the Moalboal show, it was time to change islands and we left for Bohol. 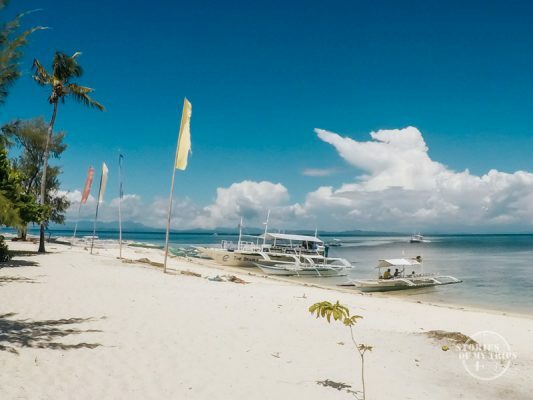 To go from Moalboal to Bohol, there is the option to go to the Taloot Wharf in Argao and from there take the ferry to Loon. Although it seems very simple on the map, logistically it is very difficult because there is no public transportation and apparently the road is not paved and there is no way to easily get there. We had to take the most traveled route and return to Cebu City. Our intention was to travel to the port of Tubigon in Bohol and from there to Carmen. This route was easier than going from the port of Tagbilaran. In the port of Cebu we only found one agency doing the route from Cebu to Tubigon (there are many to Tagbilaran). The agency is called MV Star Craft and it is located at Pier 1. They have a ferry every hour and a free shuttle to Pier 3, from where the ferry departs. The trip lasted a little over an hour and when we arrived in Tubigon we walked a couple of blocks to the bus station. Around the bus station, you’ll find many vans offering to take you to Carmen, but obviously for a higher price so we ignored them and looked for the local bus that took us to Carmen. When we reached Carmen, the bus dropped us off at the bus station and from there we walked to our hotel. When we got there we hired a motorbike to go see the sunset in the Chocolate Hills, which are only 15 minutes away by scooter. After watching the sunrise there we wanted more, so the next day we went for sunrise and we liked it even more than the sunset. That day we also took the motorcycle to the Man Made Forest, which was much farther away. To go from Carmen to Panglao we went to the road to stop the bus going to Tagbilaran, and from the Tagbilaran bus station, we walked to the Jeepneys station here to take the jeepney to Panglao, specifically to Alona Beach. We had to wait quite a while until it filled up. The ride was long and uncomfortable, but very fun because we traveled only with locals. The jeepney ended up dropping us off quite far from the beach, but walking for a while we arrived at the hotel. 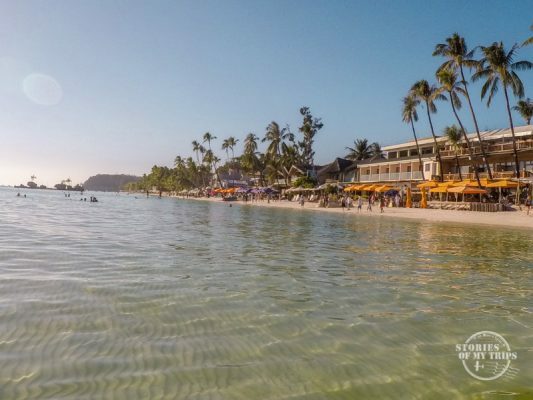 Alona Beach was not as interesting as we thought so we looked for a better beach and found that White Beach is amazing! We took a mototaxi that took us to the main entrance where there is a restaurant and many families, but walking a little bit to the right hand, the beach is totally desolate. 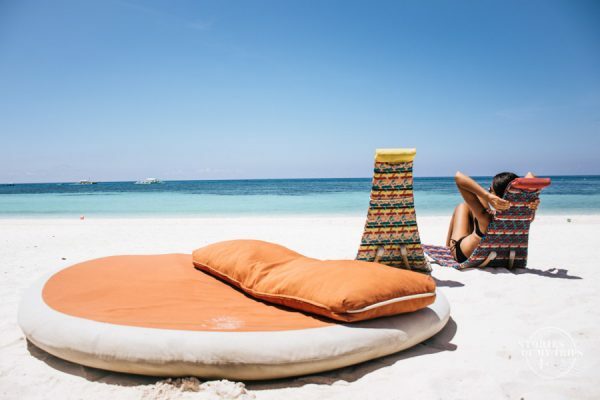 There are some hotels where the beach is only for their guests, but further away there is a hotel with a bar and you can sit on the beach for as long as you want if you buy a drink. We liked it so much that the next day we did exactly the same thing. This is where we said goodbye to paradise, this was our last sunset in the Philippines. The next day we had to return to Cebu to take our flight off to Taiwan. To go back from Panglao to Cebu City we went to the main street to wait for a Jeepney to Tagbilaran, but instead, we saw a white minibus that was looking for passengers and was priced the same as the Jeepney, so we got on it. In Tagbilaran we took the Ferry back to Cebu. From the ferry port in Cebu we took a jeepney that took us our hotel near the airport and very early the next day we had to call a taxi to go to the airport. This is how our trip through the Philippines ended. To say that we fell in love with this place is an understatement. I was about to drop everything and stay here for the rest of my life, but the internet is really bad and it is very difficult to work online. But it’s a beautiful country, the beaches were the best we saw in all of Asia, the food was pretty good and the people were super fun. This trip was just a small introduction to the country, we want to return to continue discovering its incredible islands. This is a post just about logistics and transportation, so you know how to get around in the Philippines. In future posts we will tell you more about each place and the reasons why we loved it so much. Posted in Philippines, Preparation, Routes, Transportation.